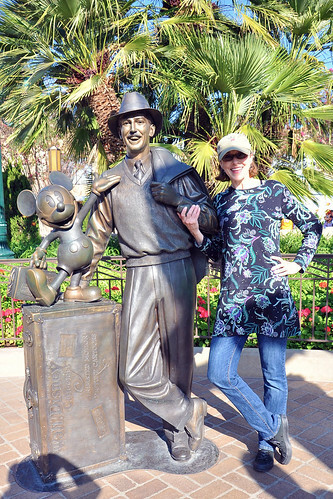 I wasn’t sure what to blog about today, and then I saw that it is Walt Disney’s Birthday today on other blogs. Since this is a crafting blog I wanted to mention the long T-shirt I am wearing. I don’t like short shirts, I think longer is more slimming. When shirts cut off at the hip it draws the eye to that part of the body which I think makes me look wider there. I have big thighs. So I bought two T-shirts in two sizes and cut off the bottom of the bigger one and sewed it to the bottom of the smaller one. The hip of the smaller was the same measurement of the waist of the larger. I don’t have a cover-stitch machine, so I did a mock cover-stitch. I overlocked the top cut edge of the skirt and attached the top by sewing over the original cover-stitching of the top with a ball point 2.5mm double needle . The 830 didn’t drop a stitch which often happened when I tried this technique with my other machines. It worked so well I bought 2 other patterns of the T-shirts and made 2 other long shirts. This entry was posted on Wednesday, December 5th, 2012 at 3:30 pm and is filed under Disneyland, Sewing and Uncategorized. Tagged: Disneyland, Sewing. You can feed this entry. You can leave a response, or trackback from your own site. How clever you are! I would have never thought to do that with a Tshirt. Though I do think you’ve got the shape to pull off any type of clothing. Love your big smile in this picture! On this snowy morning it is fun to see your sunny photo next to Walt! With your slim figure – anything you wear would terrific!! With our kids in Alaska that is in the back of my mind too.